Thor is a smart pup that just turned 4 months old. This grey and white Siberian has piercing blue eyes that are sure to charm anyone. He is full of puppy energy and loves to play with other huskies and is best friends with all of them. Thor was loved dearly by his family, however, an elderly family member moved in and having a puppy romping through the house was making life difficult. With his best interest in mind, his family asked us to help him find a new home where he could play and grow up in an environment full of love and safety. 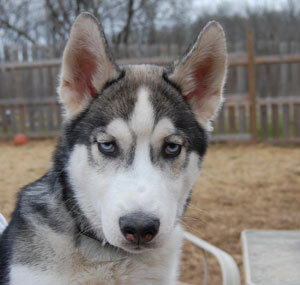 Thor is full of curiosity and mischief and is the typical Siberian puppy with much to learn. He loves everyone, both people and dogs. Thor is crate trained and working on his housebreaking. He will need to be placed in a home with another active Siberian Husky or with dog(s) his size and a family that has the time and patience to continue with his training.